Super Mario War is an entertaining Mario game where the object is to kill the other Mario players by jumping on top of them. 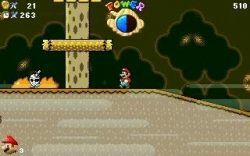 The aim is to kill as many of the other Mario players as possible, as many times as possible. You can play against the computer as well. There is a maximum of 4 players. In this version, the creator has included a level editor which is a nice addition to the game. The controls are easy to master. 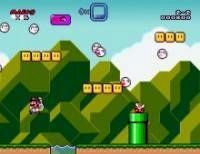 For a Super Mario game, the graphics are good if a touch simple, and the sounds are very good. The game is quite fun when you have 3 other computer players. Some my find the game gets a bit tedious after a while. 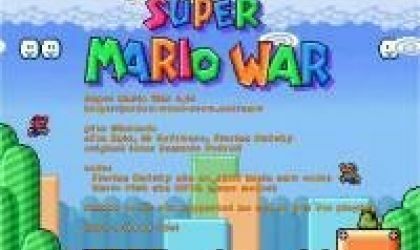 Super Mario War 101 is NOT just another remake among several. It's a masterful remake and a fun, innovative one at that. There are TONS of game modes, all unique in a different way. The same goes for arenas too! The visuals aren't stunning but that's not a surprise since this IS a remake an old game. Gameplay is great but stomping someone is easier said than done. I must say that they must have put a good amount into this game with all the modes and maps (each one having a different song) and features. Very original and fun, especially if you're a Mario fan! It's basically just like battling with Super Mario Bros. You stomp on the other guy's head to gain a kill. 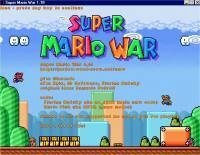 This is a good looking clone of Mario War 1.4, except that this is for Windows and not DOS. The old program does have some advantages on this one, like lava, breakable blocks, pits, and music blocks, but this one is much better looking, not to mention the sound works. You can play 4 people at a time, making it the ultimate party game. If you have a gamepad that can map to the keyboard, it will make it easier on you. Me:we have Super Mario War 101. Yeah, the good ol' "Super Mario Bros." feeling is back and it's still a heck of a lot of fun to play. The best thing in this game is the Quake/UT-like commentary. Let's get some! This is the best game in the world! There's so many modes and it's endless fun and I'm so addicted to it! It's the best! Play it with your friends after you download it. I saw this game and immediately stuck it on my flash drive. Now whenever I go somewhere me and up to 4 of my friends try play it. 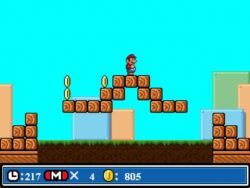 Great fun for all fans of Mario.